Tell us more about this Golden Age. What has been called the “golden age” of women’s sports took place between WWI and WWII when women started playing sports on a widespread level in North America, which caused a huge amount of media and fan interest. 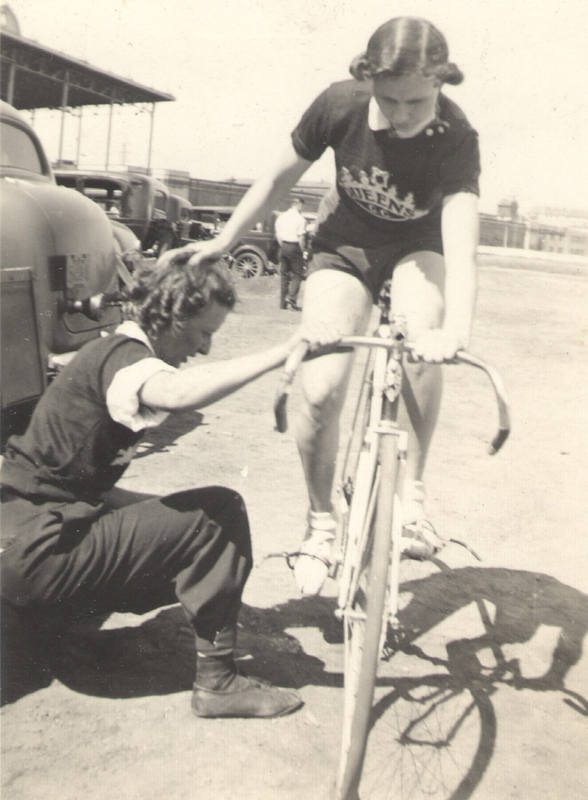 It really was this wonderful time to be a woman in cycling or other athletic endeavours. It happened because in the 1920s women were suddenly experiencing many new freedoms, so many had the opportunity to get involved in sports for the first time. But there was still – of course – a lot of discrimination. For example, there was this idea that cycling and other strenuous sports might damage a woman’s reproductive ability,. and male sports journalists would write things about female athletes that were quite disparaging (like calling them “leathery limbed flat chested girls” – and a lot worse). And there were events held for women that combined athletic competitions with beauty pageants. In fact there’s a vintage photo from one such event called “Bike Racing’s Most Attractive Girl” that I’ve turned into a perk in my film’s campaign. Tell us more about Nora’s love for cycling. Nora rode everywhere! She had a girls’ one-speed coaster bike, the kind where you pedal backwards to brake, and it was her main method of transportation. She had some interesting stories about riding around the city as a woman then. For example, she told me of one instance where a police officer stopped her and gave her a hard time when she was riding on College Street at night. The implication being proper young ladies don’t stay out in the evening, especially on bikes! There were also a number of long-distance road races that Nora competed in during the 1930s on the streets and environs of Toronto, and sometimes she was the only woman in them. There’s a great story about Nora’s experience in one such race, which she tells herself, in a video our film team contributed to the Bike City exhibit at the St. Lawrence Market Gallery. Tell us more about the film itself. Why animation? 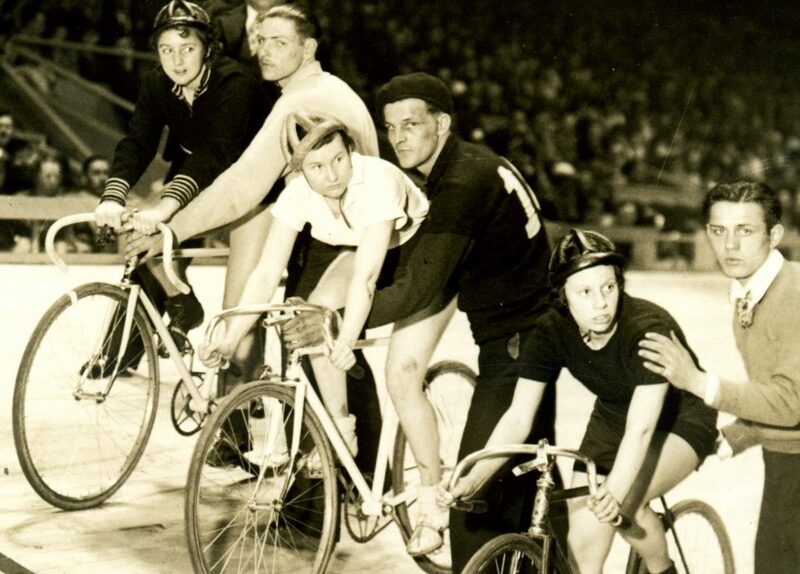 It’s a short film that will introduce audiences to Nora and the Golden Age, and then transition to the story of the time in 1936 when a small group of that era’s top female cyclists, including Nora, were invited to put on a demonstration race as part of a men’s six-day race at Maple Leaf Gardens. Men’s six-day races themselves were this wacky phenomenon – it’s going to be a great atmosphere to recreate on film. I’m not going to say much about the race itself and how it turns out, except to say that it will be exciting and have lots of surprises. The film is going to be a collage of live action footage, archival images, and animation, with animation being the bulk of it. I’ll have Nora telling the story wherever possible on film and voice over. The race itself will be animation, because there’s no footage from this event. I get to recreate what it looked and sounded like, and that offers an incredible creative opportunity and control. Why do you think it is important to celebrate women and cycling? It is empowering for women and girls to know about early female cycling pioneers and role models. And obviously it’s important for men and boys to know about them too. Nora had some profile in her life – but nothing anywhere near close to what she deserved. I mean, she really was one of the first and best female cyclists in Canada – how can we not know about her? Thank you for asking! dandyhorse readers are this film’s kind of people – who would be interested in stories where local history, cycling, feminism, and art intersect. I really would love the community’s support. So I’d love it, of course, if people could contribute and help to make my crowdfunding campaign wildly successful. My goal is to raise $15,000 by November 6, 2018. Every donation helps, even $1! Join our mailing list, connect on Facebook, Instagram, and Twitter, like and share our stuff online… word of mouth and community support means everything to grassroots films like this one.